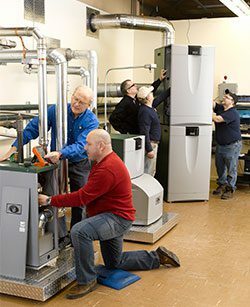 Boost your industry knowledge and earn continuing education credits* with live-fire, hands-on training at PB Heat, LLC's Peerless® Boiler Training Center. Open to professional installers, contractors, engineers and wholesalers, our 2-day training includes our popular Colors of Heat curriculum - on either one-pipe steam or hydronic piping, along with a full-color manual. Participants earn (2) certificates equal to the value of the seminar to be used towards the purchase of future Peerless® Boilers. May 14 & 15 – Condensing Boilers & Color of Water – SOLD OUT! August 20 & 21 – Condensing Boilers & Color of Water – SOLD OUT! We offer customized technical classes at the factory for groups of eight to twenty-five. Also, don't forget about our Road Show trainings in the Live-Fire Training Trailer for groups of twelve to fifteen. Contact us for more details! * All full-day Boyertown location training seminars will carry 7 hours of NATE and 4 hours of NORA continuing education training! Registration is limited to 25 participants. These classes are hands-on, take-things-apart, put-them-back-together sessions. They are geared for technicians of all skill levels. We encourage attendees to bring their smart phones, laptops, analyzer and tools. We have them as well. The training is interactive and designed to provoke critical thinking when working with heating systems. Attendees will be asked to work out trouble-shooting problems based on what they have learned and to develop game plans to investigate system problems. Resolving problems is one part of the live-fire training. Understanding how to prevent problems is the natural extension of that knowledge. The Color of Water or Color of Steam book provided in class, along with other handouts will be handy references for installing and tuning all types of boilers.